SIVIWE Mbele is a fighter. The 18-year-old lost her mother when she was in Grade 4 and her father has never been a part of her life. Raised by her grandmother in Alexandria, she attended Ukhanyo Secondary School, where she was one of a handful of pupils studying mathematics and science. Despite not having a science teacher for most of last year, she passed the subject with marks high enough to qualify for university entrance. She was one of just six to pass maths – and she did so with distinction. Now studying towards a BSc (Information Systems) degree at Nelson Mandela Metropolitan University, the determined student’s efforts have not gone unnoticed. Yesterday (15 July), Mbele was named as the first recipient of a R25 000 bursary from the NMMU Trust’s newly-launched “Ignite a candle” bursary legacy campaign. The campaign is determined to identify 10 promising Eastern Cape students whose circumstances have made it difficult or impossible for them to gain access to tertiary education – and throw them a lifeline. What is special about this campaign is that it is the contributions of individuals – and not companies – that are being sourced to build up the bursaries. 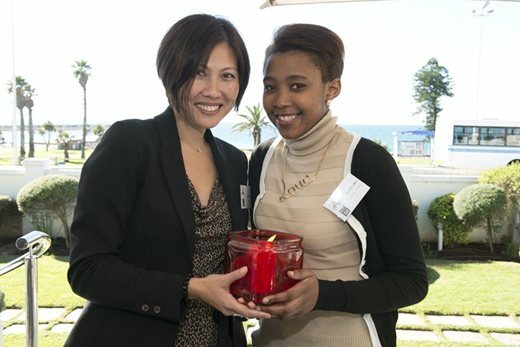 For the first bursary, awarded to Mbele, 50 individuals from the Bay “bought” a virtual candle worth R500, and their contributions collectively made up the R25 000 bursary. The aim now is to get enough individuals to contribute their R500 to raise the other nine bursaries. Ultimately, the Trust hopes that the studies of these 10 students will be covered for the duration of their degrees through the “Ignite a candle” campaign. NMMU Trust acting CEO Renita Affat said the critical state of education in the province – where statistics showed only 7% of pupils complete secondary school and less than 1% complete tertiary education – had been the catalyst for the campaign. Asking individuals rather than companies to contribute was to make it personal. “We want to make this campaign tangible and interactive – we want those who contribute to be able to track the individual they are funding, to share [with them] their own values, ideas and advice and even offer internships.” Contributors will be able to “track” their student using an interactive web-based programme. Affat said the 10 recipients will all be people who have “shown tenacity and perseverence”. “Like Siviwe, they will be responsible individuals from previously disadvantaged schools who, despite their circumstances, have managed to get into university. “We want this campaign to become a movement – where people want to become a part of it and add value. Mbele, who burst into tears when Affat informed her of the bursary this week, said: “It was a big surprise. I didn’t expect it. Mbele said she had adapted well to university life and was enjoying her course. “I’m a person who wants to succeed. I want to be proud of myself.